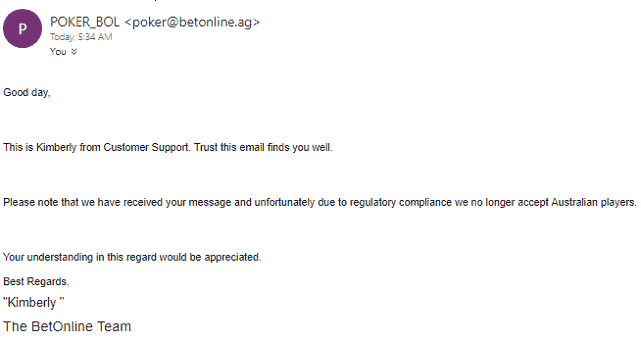 The three Chico Poker Network sites, Sportsbetting.ag, BetOnline, and TigerGaming, are no longer offering their services to Australian customers. Users from Down Under started reporting being blocked from accessing their accounts on April 16. 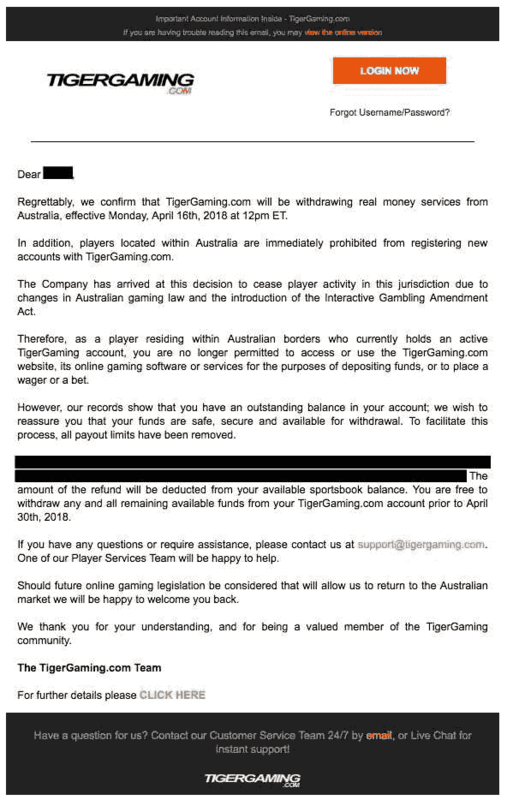 Regrettably, we now confirm that TigerGaming.com will be withdrawing real money services from Australia, effective Monday, April 16th, 2018 at 12pm ET. In addition, players located within Australia are immediately prohibited from registering new accounts with TigerGaming.com. The Company has arrived at this decision due to changes in Australian gaming law and the introduction of the Interactive Gambling Amendment Act. 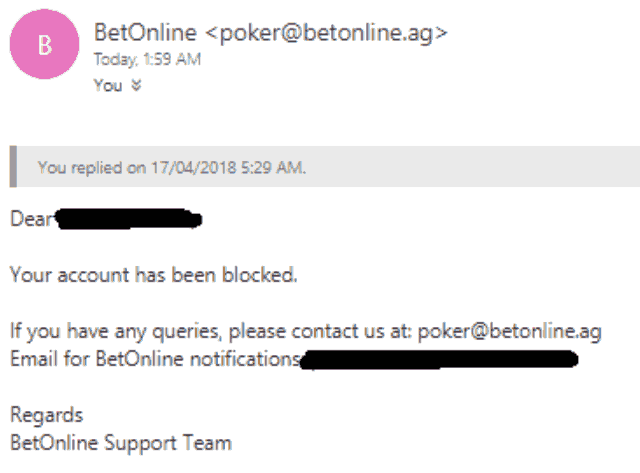 Therefore, as a player residing within Australian borders who currently holds an active [insert brand name] account, you are no longer permitted to access or use the TigerGaming.com website, its online gaming software or services for the purposes of depositing, or placing a wager or bet. However, our records show that you have an outstanding balance in your account; we wish to reassure you that your funds are safe, secure and available for withdrawal. To facilitate this process, all payout limits have been removed and you are free to withdraw any and all funds from your TigerGaming.com account prior to April 30th, 2018. If you have any questions or require assistance, please contact us at support@tigergaming.com. One of our Player Services Team will be happy to help. Should future online gaming legislation be considered that will allow us to return to the Australian market we will be happy to welcome you back. We thank you for your understanding, and for being a valued member of the TigerGaming community. Anyone now attempting to sign up for either Sportsbetting.ag, TigerGaming, or BetOnline no longer sees Australia listed as a valid country in the drop-down menu of the registration form. The managers of the Chico Network are probably worried about being found to be in violation of the Interactive Gambling Amendment Bill 2016, which was referenced in the TigerGaming email. This legislation prohibits offshore firms from offering poker, casino, and certain other betting services to Australia's residents. Even just advertising internet gaming products to Australians can cause an organization to run afoul of these restrictions. Any entity found guilty of infractions under this law is subject to hefty penalties and possible criminal prosecution. The Interactive Gambling Amendment, which came into effect August 2017, scared off a number of poker sites from the Australian market. PokerStars, PartyPoker, 888poker, and Intertops are just a few of the companies that used to welcome Aussies but now no longer do. Most of the online poker and gambling entities that pulled out of the Australian arena did so in the waning months of 2017. Other organizations weighed the risks and concluded that they would continue to operate in Australia because the chances of actually being prosecuted for violations of the law were miniscule. It initially appeared that the Chico Poker Network was going to stay the course, but it looks like they got cold feet for no readily discernible reason. The answer may lie in the doings of the Australian Communications and Media Authority (ACMA), the body tasked with enforcing the Interactive Gambling Amendment and other related legislation. In recent months, the ACMA has worked to identify enterprises that might be breaking the law and liaising with them to get them to stop. The ACMA seems to prefer acting behind the scenes, convincing companies to voluntarily cease offering gambling products in Australia rather than targeting them with legal action. It's rumored that the ACMA was behind online sportsbook Pinnacle's determination to get out of the Australian betting market last month. It's possible that Chico was identified by the ACMA as being an offending party and was quietly convinced to halt its illicit operations in Australia. Despite the removal of the Chico Poker Network's sites from the menu available to Australian players, there are still several upstanding poker rooms that you can join. It's important to note that none of the provisions of the Interactive Gambling Amendment Bill 2016 criminalize the act of playing online poker. It's only those who are in the business of running the games who have anything to fear. The largest site that still accepts Australian customers is Ignition Casino Poker. As its name implies, it offers both a poker room and an online casino. You can get a separate 100% up to $1,000 bonus for each of these products. Read our comprehensive Ignition Poker review page to learn more about this site, including how to create an account. To explore your other options for online card games, check out our guide to Australian online poker, which explains the laws that relate to this pastime, the leading internet sites, the history of poker in Australia, and more.